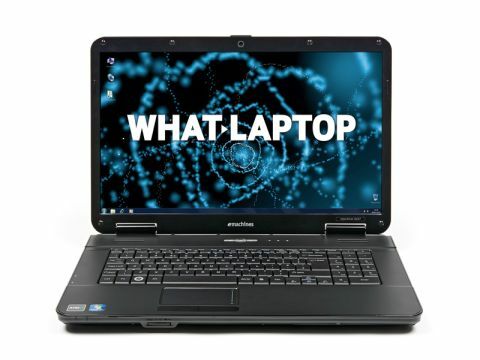 Californian company eMachines was taken over last decade by Acer, but the brand is still used for entry-level laptops. The eMachines G627-202G25Mi has some strong points, such as an excellent screen, but performance and portability lag far behind the competition. With a massive 17.3-inch screen and a hulking chassis that's 44mm thick, this is a big laptop, thicker than the 17.3-inch Toshiba Satellite C670D. At 2.8kg, it's also heavy, and best left on a desk at home. That said, the eMachines G627-202G25Mi is a decent-looking laptop and solidly built, except for a little flex around the palmrests. The keyboard is a good size, despite not stretching the width of the chassis, and the firm typing action makes it comfortable to work on all day. We expected a larger touchpad, but at least it's responsive and features a scrollbar for quick navigation. The extra screen space makes this an excellent laptop for consuming your media. Films and photos look fantastic on the large Super-TFT panel, and this is an impressively bright and colourful screen. Viewing angles are reasonably wide and the display tilts all the way back. The eMachines G627-202G25Mi features an AMD processor, known for its cheap budget performance. Sadly, it produced low benchmark scores, proving itself capable of only the most basic tasks, such as browsing the web and word processing. Graphical performance is also restricted to viewing photos and watching DVDs. HD video stutters constantly and even basic games struggle. If you want a laptop to edit your media, the Acer Aspire 5741z is a much better option. Three hours of battery life is also a mediocre result, but as previously stated, we wouldn't want to travel far with the eMachines G627-202G25Mi anyway. You have enough space for thousands of photos and songs on the 250GB hard drive, which is standard for a laptop of this price. Other features are, unfortunately, a disappointment. For a start, wireless networking is a little slow, with no support for the speedy 802.11n standard. The only ports you get are a VGA connection for hooking up external monitors and a measly two USB ports for attaching peripherals such as mice and external hard drives.